You want the fishability of a FISHIN' BARGE, but the extensive seating and storage of a PARTY BARGE. So, check out the SportFish 22 DLX, the best of both worlds! Up-front and mid-ship, you'll find three spacious lounges, each with spacious underseat storage and Stow More compartments, as well as a QuickLift Bimini for relaxing out of the shade and a movable table for an on-the-water picnic. 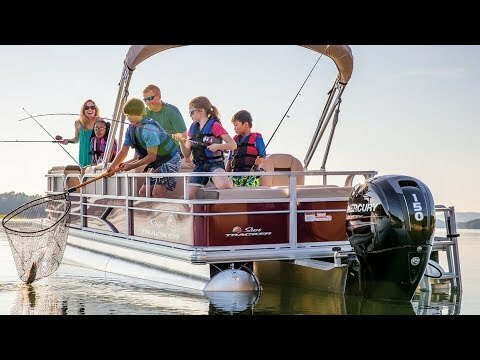 And aft, you'll find a spacious fishing deck that's filled with features like two fishing chairs, an aerated livewell, lockable rod storage and more! Who says you can't have it all? No one with a SportFish 22 DLX, that's for sure! Max. person weight: 1453 lb. Max. person, motor & gear weight: 2115 lb. Average dry weight: 2159 lb. Average package weight: 3993 lb.